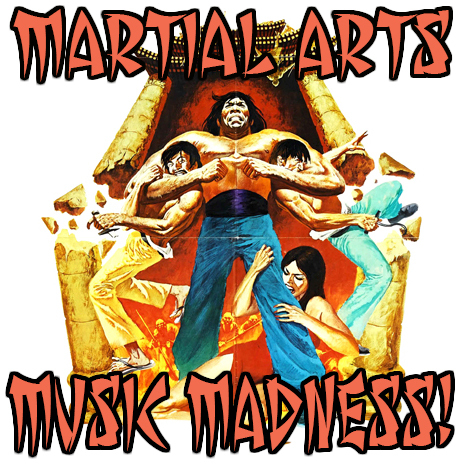 In this section of The GCDb we will be listing the various scores from kung fu/martial arts films that have been taken from other films, pop music & TV. During the 1970s and early 80s it was common practice for lower budget Asian genre films to steal scores from other popular films of the day. For instance you could be watching a Shaw Brothers kung fu film and hear the theme from a Blaxploitation film or a Spaghetti Western pop up in a sequence. This is just another reason why watching exploitation cinema is so fun. We hope you enjoy discovering...or re-discovering this memorable film music with us! A Life of Ninja: Main theme from the film Rocky II. Music by Bill Conte. Cues from the TV miniseries: Shogun. Music by Maurice Jarre. Battle of Shaolin: Main Theme from the film: The Big Gundown. Music by Ennio Morricone. Bruce Lee Fights Back From the Grave: "Willie Chase" by J.J. Johnson from the film Willie Dynamite, Various cues from the film Rocky. Music by Bill Conte, Cues from the film Enter The Dragon by Lalo Schifrin. Bruce Lee the Invincible - Main theme from The Outlaw Josey Wales. Challenge of the Tiger: "Run Fay Run", "Hung Up on My Baby" by Isaac Hayes from the film Three Tough Guys. The Chinese Godfather: Cues from the film Enter The Dragon Music by Lalo Schifrin. Dance of Death: The Pink Panther theme by Mancini and For a Few Dollars More by Morricone (Angela Mao even dresses up as Clint). Death Duel of Kung Fu: Main theme from the film Hang Em High. Music by Dominic Frontiere. Death of Bruce Lee: "Algiers, November 1, 1954" by Ennio Morricone from the film The Battle of Algiers. Dragon On Fire (aka The Dragon, The Hero): "Title Theme" from the film The Big Gundown by Ennio Morricone. Dynamo: "Flight in The Night" by Charles Bernstein from the film Gator. Enter the Game of Death: Enter The Dragon Title Theme" by Lalo Schifrin, "Bond 77" by Marvin Hamlisch. Enter The Silver Fox: The Big Gundown Main Theme and The Surrender by Ennio Morricone. Exit The Dragon, Enter The Tiger: "Theme from the film Three Tough Guys by Isaac Hayes, "Shine on you Crazy Diamond" by Pink Floyd. Fatal Needles vs. Fatal Fist: "Main Theme" from the film Carrie by Pino Donaggio. Fearless Hyena: The Pink Panther Theme by Henry Mancini. Fists of Bruce Lee: Live & Let Die Paul McCartney and Wings, "Pick up the Pieces" (not the AWB version), "Broken Mirrors" Lalo Schifrin from Enter The Dragon, "Ali Bomaye" Mandrill & Michael Masser, "Hung up on my baby" Isaac Hayes from the film Shaft. Five Fingers of Death: Ironside Theme (TV) by Quincy Jones. Game of Death II: The Dunwich Horror Title Theme" by Les Baxter (Heard on the Cantonese track). Hit Man in the Hand of Buddha: Cues from the film White Lightning. Music by Charles Bernstein. A Silouette of Doom from the film Navajo Joe. Music by Ennio Morricone. Horse Boxing Killer: Hang Em High Main Theme by Dominic Frontiere. Image of Bruce Lee: Score cues from the film Taxi Driver. Music by Bernard Herrmann. Invincible Obsessed Fighter: Cues from the film First Blood. Music by Jerry Goldsmith. "Assassination Attempt" by Bernard Herrmann from the film Taxi Driver. Kung Fu Superman: "Col. Gutierez Theme" from the film Duck, You Sucker. Kung Fu The Invisible Fist: "Blowin' Your Mind" by O.C. Smith from the film Shaft's Big Score. "Junkie Chase" from the film Super Fly by Curtis Mayfield. Cues from Once Upon A Time in the West by Ennio Morricone. Legendary Weapons of China: Mad Max Title Theme" by Brian May. Mad Monkey Kung Fu: "Assassination Attempt" from the film Taxi Driver by Bernard Herrmann. Mafia Vs Ninja: Cue from Shogun TV miniseries. Music by Maurice Jarre. Cue from the film First Blood. Music by Jerry Goldsmith. Cues from Mad Max & The Road Warrior. Music by Brian May. Battlestar Galactica TV Theme. Music by Stu Phillips. Mar's villa: Main Theme and various cues from the film Hang Em High. Music by Dominic Frontiere. Cues from the film The Man With The Golden Gun. Music by John Barry. Master of Death: Title Theme from the film The Big Gundown by Ennio Morricone. Ninja Strikes Back: Enter The Dragon Main Theme" by Lalo Schifrin. One Armed Boxer: Cues from Shaft Music by Isaac Hayes. One Armed Swordsman: Music cues from the film Duel at Diablo by Neal Hefti. Queen Boxer: "Theme from the film Shaft by Isaac Hayes. Return of Bruce: Enter The Dragon Title Theme by Lalo Schifrin, "On The Move" by Rich Tufo/The Impressions from the film Three The Hard Way. Return of The Chinese Boxer: "Magic & Ecstasy" and variations by Ennio Morricone from the film: Exorcist II: The Heretic. Return of the Tiger: "Theme from S.W.A.T." (TV) by Rhythm Heritage, "Play That Funky Music" by Wild Cherry. Shaolin Tiger's Claw: Sue-Lin chase, Ending Battle cues by Lalo Schifrin from the film Enter The Dragon. Shaolin Vs. Wu-Tang: "Assassination Attempt" by Bernard Herrmann from the film Taxi Driver. Snake in The Eagle's Shadow: "Space" by Magic Fly. "Main Theme" from the film Carrie by Pino Donaggio. Shanghai 13: "Jam Sandwich" by Jimmy Page from the film Death Wish 2. Soul Brothers of Kung Fu: "Main Theme" from the film Rocky by Bill Conte. "Main Theme" from the film Carrie by Pino Donaggio. "Laying the Trap" from the film Gator by Charles Bernstein. - "Fly Robin Fly" by The Silver Convention. Live and Let Die by Wings. Ten Tigers of Shaolin: "Climbing Devil's Tower" from John Williams' score to Close Encounters of the Third Kind (1977). The 36 Deadly Styles: Pink Panther Theme by Henry Mancini. The Big Boss: "Time" by Pink Floyd (Heard on the Cantonese track). The Lizard: "One of These Days" by Pink Floyd. Two Wondrous Tigers: Music cues by Ennio Morricone, from the film My Name is Nobody. Vengeance! : On Her Majesty's Secret Service Title Theme by John Barry. Young Tiger: "Immigrant Song" by Led Zeppelin (Instrumental/Cover), "Junkie Chase" by Curtis Mayfield from Super Fly. This page was last modified on 19 January 2019, at 14:58.